WASHINGTON — Yet again, Chinese military aggression is riling Japan as both countries dispute an island chain in the East China Sea. The islands, known to the Chinese as Diaoyu and Senkaku to the Japanese, have mineral deposits which are the focus of the territory dispute. 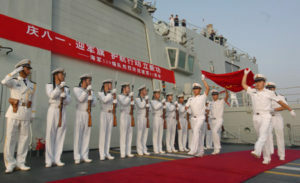 Reuters reported Chinese coastguard ships were sent to the area after the current Japanese Prime Minister, Shinzo Abe, sent a ritual offering to a Japanese war memorial in Tokyo. China has previously sent air patrols close to Japanese airspace, particularly the islands, which could have sparked a potential military conflict. The Yasukuni Shrine has been a hotspot in Japanese foreign affairs as formerly conquered countries like South Korea and China have been offended by Japanese politicians paying respects to the country’s war dead. The island chain has a couple residents, but the islands are uninhabitable. The dispute over who possesses the islands go back beyond the late 1800’s and probably will not end anytime soon.